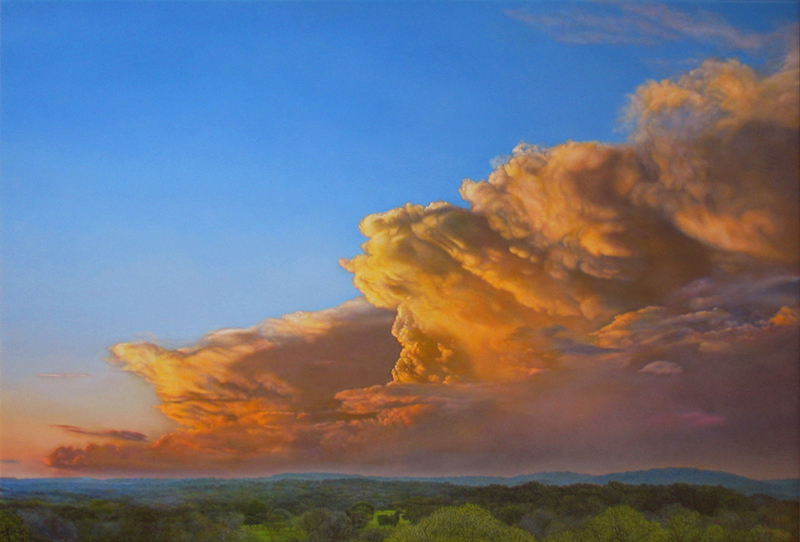 “When the Saints Come Marchin’ In,” a painting by Austin artist Jon Eric Narum, portrays a skyscape at the edge of the Texas Hill Country. Copyright 2006 Jon Eric Narum. Used by permission of the artist. Texas Climate News is an independent, nonprofit, nonpartisan magazine that publishes reporting and analysis about climate and sustainability. We produce public-interest journalism, based on traditional principles of independent-mindedness, accuracy and fairness. We don’t publish editorials, commentaries or other opinion-based articles. We don’t advocate policies or endorse candidates. Texas Climate News is self-published by a nonprofit corporation of the same name, established in 2014 and based in Houston. Texas Climate News is supported entirely by grants from foundations and donations from individuals. We currently operate with funding from the Jacob and Terese Hershey Foundation of Houston. The Hershey Foundation’s generous support for our operations in 2019 was granted in honor of Frances Tarlton “Sissy” Farenthold, a former member of the foundation’s board of directors and a former politician, attorney, activist and educator. Readers’ support is crucial. Please consider making a donation to help us continue our work. TCN is a 501(c)(3) organization, so your donation will be tax-deductible. TCN’s editors and writers make all editorial decisions independently, with no direction or influence from our funders. Contact us by email at texasclimatenews@gmail.com. Receive regular updates about TCN’s coverage via our weekly email newsletter and our RSS, Twitter and Facebook feeds. The email newsletter includes a compilation of our recent coverage. The RSS, Twitter and Facebook feeds are updated when each new article is published in TCN Journal, Features or In Passing. Texas Climate News does not generally permit republication of complete versions of our original articles – those published in our TCN Journal, Features and In Passing sections. Any republication of entire articles requires prior permission in writing by TCN’s editor. Of course, publication of brief excerpts from our original articles is permitted by the fair use doctrine. Credit and link any such published excerpts to Texas Climate News. Texas Climate News was conceived by founding editor Bill Dawson and published from 2008-15 by the Houston Advanced Research Center, a nonprofit, nonpartisan organization. TCN’s journalists were not HARC employees and made all editorial decisions independently.